Browse: Home / 2016 / June / 29 / U-Turn! Scientists At The PIK Potsdam Institute Now Warning Of A “Mini Ice Age”! The daily Berliner Kurier here writes today that solar physicists at the ultra-warmist Potsdam Institute for Climate Impact Research (PIK) are warning that Europe may be facing “a mini ice age” due to a possible protracted solar minimum. For an institute that over the past 20 years has steadfastly insisted that man has been almost the sole factor in climate change over the past century and that the sun no longer plays a role, this is quite remarkable. According to the PIK scientists, the reduced solar activity will, however, not be able to stop the global warming and only brake the warming up to 2100 by 0.3°C. Given the extreme warnings of warming and sea level rise put out by the Potsdam Institute in the past, this still represents an extraordinary admission, one that has us suspecting a major climate turnaround may be ahead – despite all the efforts by the Potsdam Institute to play it all down. Here we see them possibly setting up a global warming postponement of a couple of decades. The sun plays a role after all. The source of the Berliner Kurier report is the Austrian weather site wetter.at here. The wetter.at site writes that some solar physicists suspect the current solar inactivity may be “the start of a new grand minimum” like the one the planet saw in the 17th century and left Europe in an ice box. Dozens of studies show Little Ice Age was global! Though most scientists agree that the Little Ice Age took place, many dispute its extent. Some insist it was localized over the North Atlantic region. But now there are dozens of studies that show it was in fact a global event. That should make us worry. I thought this was interesting, and ties in with the sun’s magnetic field. “The Sun has likely already entered into a new unpredicted long-term phase of its evolution as a hydrogen-burning main sequence star — one characterized by magnetic sputtering indicative of a more quiescent middle-age. Or so say the authors of a new paper submitted to The Astrophysical Journal Letters. So, what sort of long-term impact will such a shift in the Sun’s magnetic evolution have on Earth’s climate? Pfft. The Sun is not a “hydrogen burning main sequence star”, it no different than a Neon light-bulb, powered externally by Birkeland Currents of Electricity, a product of the z-pinch of said Birkeland Currents. Magnetic fields cannot exist in space without an electric current, which is the prime mover. The color and variability of our star, The Sun, is dependent on the amount of this current it is receiving from our galaxy. We have no way of knowing or predicting the magnitude of this current, except that it SEEMS to follow a cycle. The Sun is a much more variable star, in terms of light output if you look at ultraviolet, instead of visible wavelengths. With further and further reduction of the protective effects of the Sun’s electricity flow, the Earth will experience greater and greater influences of Cosmic Rays, which produce clouds in the atmosphere, reducing Solar Irradiation, producing more and more cooling. MY observation is that this Spring and Summer here in the temperate zone this year is much cooler than any Summer or Spring I have recently experienced. It is also cloudier, and producing more rain than recent years. Spot on sir!!. Also something worth considering is the configuration of Saturn and jupiter during the last mini ice age/s, they seem to be entering a similer pattern over the next few years.There is talk of Saturn and Jupiter being brown dwarfs eluding to the notion that they may well have been Suns in the own right in our ancient past. I would imagine our solar system would have been unrecognizable compared to today. The best scenario for the entry if Earth into the current solar system would be that the Sun was accompanied by a close-orbiting Jupiter. Nearly all exoplanets discovered are “gas giants” in close orbit around their primary star. Then, Earth, along with Saturn, Mars and Venus, entered the heliosphere of the Sun as part of a string of objects called a Herbig-Haro object. This is when the brown dwarf, Saturn, became “electrically visible” to the Sun, and had to give up its electrical current to the more positively charged Sun, and thus giving up its status as a star at all. All through antiquity, Saturn was named as our “first, best sun”. Saturn’s original name was, after all, “Helios” (the Sun). That was during the Golden Age. Do we keep tabs on volcanoes under the oceans? worth doing. This just in: SPD-boss Gabriel castrates Warmunist Morgenthau 2.0 plan by SPD envirominister Whatshername – Hendricks – that demanded , well the usual stuff Warmunists demand; no combustion processes in 2050 combined with 20% less ‘leccy consumption, that sorta thing. SPDCDU obviously so deep in the doo-doo (Islamisation, EU collapse) that they don’t dare to further the Warmunist de-industrialisation attempts. Which says a lot because these people are normally totally ruthless. Not at all: The colder it gets outside the more efficient becomes the Carnaugh cycle! Of course if you’re trying to stay warm inside and pumping heat in from the colder outside, then you’ve got more work to do. A German house wife understands that in a time of cooling you should not prevent warming. We did not hear anything of Schellnhuber. Is he rewriting his manifesto, explaining to the public why we still need a world government? Contrast that picture above of their forecast sc24 with this one of the ACTUAL sc24, both alongside the sc23 for comparison. Some forecast it to be like sc5, even before sc24 started, and guess what! That guy seems to have ‘nailed it’. They can’t even forecast sunspots, but they can forecast temps a century away. Right! The graph – You are here, in 2009 – seems a little outdated. “According to the PIK scientists, the reduced solar activity will, however, not be able to stop the global warming and only brake the warming up to 2100 by 0.3°C.”. There are a lot of assumptions in that statement. Apart from the obvious ones, like ‘climate models are reliable’, they are assuming that the system is linear. It isn’t. There is a substantial body of work on the subject of solar impact on climate, more than you will find on blogs. We are mainly interested in solar variations related to climate variations. Variation in solar irradiance during the 11-year cycle account for only about 0.1 W-m2 variation at the top of the atmosphere, compared with 1360 Wm-2 total solar irradiance. 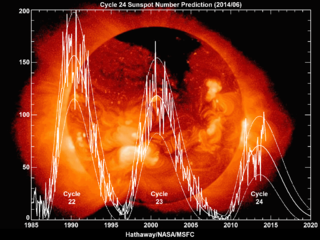 So it is correct to ignore single solar cycles as others have advised. Steinhilber et al have estimated longer term variations using proxies, They estimated that since the Maunder minimum about 400 years ago, increase in TSI has accounted for an increase of 0.9 W-m2 at the top of the atmosphere. Steinhilber compares with the modern radiative imbalance estimated by Hansen et al (2011) of 0.6 W-m2. My understanding is that when we compare the estimates by Steinhilber and Hansen, the entire warming from the Maunder minimum to the present could be accounted for by solar activity. Therefore, to dismiss the role of the Sun we ought first to falsify Steinhilber and the results of other groups of researchers that have made similar claims. Solar effects upon climate may not end with TSI, because the Sun varies more in the UV part of the spectrum than in the visible part, which may impact climate via the ozone level. Astrophysicists, such as Frisch and Zank have studied the impact of the local interstellar cloud upon the heliosphere. (reference below). Best to remember that some astrophysicists are competent as climatologists, especially in relation to the impact of stars upon their planets. A very few astrophysicists study the gravitational impact of giant planets upon their suns. The barycenter of the solar system is not at the center of the Sun, but near its surface. (A similar relationship between Earth and Moon creates tides on Earth.) The revolution of the Sun about the barycenter may affect its dynamo(s), solar magnetism and the solar wind that modulates the flux of cosmic particles that enter the Earth’s atmosphere. Some physicists claim there is a relationship between cosmic ray flux and the Earth’s albedo via variations in certain types of clouds. See Halle et al, below and Shavi and Veizer. Jasper Kirkby ran a lab test at CERN to check the physics. To address this question moderately well might take about three months review of the literature. The following references may help. SUNSHINE, CLOUDS AND COSMIC RAYS. What role has the sun played in climate change in recent decades? – ResearchGate. Available from: https://www.researchgate.net/post/What_role_has_the_sun_played_in_climate_change_in_recent_decades#572204fbdc332dbeae79b7b6 [accessed Apr 28, 2016]. In the late Ordovician Period, the planet plunged into and warmed up from the Andean/Saharan ice age, all at about 10 times the current CO2 level. This and the observation that CO2 change follows temperature change rule out atmospheric CO2 as a significant factor in climate change. How can you even mention the cosmic ray effect on climate without linking to anything by Svensmark? If it weren’t for him, the CLOUD experiment would never have been done. They didn’t want to, but were forced to in order to disprove his theory. Didn’t work out for the warmists, though. Thank you for the Shaviv, Veizer link. I didn’t have that one. Here’s another of his on the clear correlation of solar activity with earth’s climate. Note that multiple proxies are in agreement. We still dont know the effects of an extra or less 0.01 on the earth do we regarding irradiance. Hi from Oz. Frederick C – As an ex-radio amateur (Ham) I am very familiar with the effect of sunspot activity on the ionosphere (which causes major changes in the reflection of various frequencies of radio waves via ionisation). I note your comment regarding the small variation in solar irradiance, but I understand that the variation in the UV component is several times larger, and if UV is responsible for atmospheric ionisation, then this may be the cause. BTW, as water is a polar molecule, any increase in UV and/or electro-magnetic activity may have a significant effect on clouds as well. As the ‘warming’ is theoretical and impossible to discern from natural variation, so the amelioration of cooling by solar influence hitherto considered to have none, is equally unknown as it was unpredicted (IPCC). What remains entrenched is the delusional political faith that has long surpassed its use-by date exemplified by the disintegrating supra-national EU and its 2030 bedfellows, the UN. Mutually dependent on a modeled climate narrative, they become consigned to the non-recycle garbage can of history. Covering both bases with one foot. How can that be? Climate scientists have specifically ruled out solar activity. I have volumes of papers in arguments that categorically state that the suns activity has no effect on climate whatsoever. They have the charts showing co2 and the effects of co2 on climate going back 100,000s of years. None of which show any function of solar activity, or any other variable. If this is true regarding solar activity, how much of the current run up in temperature has the modern active sun been responsible for? ” I have volumes of papers in arguments that categorically state that the suns activity has no effect on climate whatsoever. It’s not true. But do be a good fellow and site one or two of those “papers” so we can have a good laugh. Truth, like water, is a slow working solvent, but with time, it can enter the smallest crack and begin the dissolution of fabrications. This is a small concession, a small crack, in their armor made out of magical consensus material that they believe is impervious to criticism due to the the holier-than-thou glow of righteousness in their belief that only they can save the world from the weather. This would make a great Shakespearian plot, IMO. Umm, and if I mix the information you have given here with that of https://chiefio.wordpress.com/2016/07/01/ceta-canada-e-u-trade-agreement/ and https://judithcurry.com/2016/06/27/are-we-headed-for-a-new-solar-minimum/ , then I can make one heck of an idea…. If UN/EU elitists really knew that a big devastating freeze is likely to happen soon (within a generation or two), and it will, in all probability, affect the densely populated areas of the Northern Hemisphere the most. Then we have to wonder, what’s the ultimate aim of the UN & EU elitists? Is it to get western nations to horde their fuel stocks and go all out for fossil fuel replacements, get western economies to slow down and consume less for the future? But do this without frightening the western population too much; distract them with a lots of pseudo-scientific crap-twaddle about CO2, and knotty bureaucratic procedures about sustainability all wrapped in never ending environmental issues and investigations. At the same time ease finances to China to ensure that there is a reasonably good manufacturing base when the freeze comes. And while we are at it, sow the seeds of conflict in geographical areas that are resource rich and most likely to survive a big freeze, thus ensuring that necessary supply lines can be easily commandeered later when required. Could not this be their ultimate ‘plausible deniability’? That way they could say they have to destroyed western capitalism in order to save the west’s future. Have the western nations tie themselves up in so much bureaucrat blather that they fail to progress at full speed. The ultimate reason for a ‘New World Order’? I know, I know, it’s a deep and dark scenario, but is it *that* unlikely? That’s why woolly mammoths were found “flash frozen” with food in their mouths and their digestion “stopped cold” as it were, and their flesh still edible for huskies 40,000 years later?